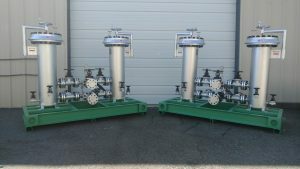 Liquid Process Systems, Inc. known for its side stream thermal fluid filtration systems, recently shipped two more duplex liquid filtration systems to a large, multinational petrochemical consortium located in the North Pacific region. Just over five years ago, in the fall of 2011, this client approached us for a very challenging RFQ for filtering hot process liquid. Our team analyzed the specifications and the existing systems in place at the plant and designed a solution that fulfilled the client’s requirements for filtration. Several months of design and collaboration with the client resulted in a Purchase Order for a large filtration unit that we delivered promptly the following spring. It was a welcome development and an important validation of our equipment that Liquid Process Systems, Inc. was fortunate to receive a new order for two additional systems in the summer of 2016. Liquid Process System’s patented side stream filters are very robust. They feature sturdy, all welded construction and are built according to stringent ASME Pressure Vessel specifications that are a characteristic of industries using heat transfer fluids at high process pressures and temperatures such as petrochemical, lamination, roofing materials, plastics, food, engineered wood, petroleum, chemical and pharmaceutical industries. The patented high temperature side stream filters from Liquid Process Systems are installed on hot oil and thermal fluid heating systems to continuously clean heat transfer fluid without shutting down the main process. Removing contaminants increases up-time and works to make the entire heating system operate more reliably and safely. The result is an increase in heat transfer efficiency with easy and simple maintenance routines to keep the heat transfer fluid clean and help extend fluid life. For over 24 years, Liquid Process Systems, Inc. has been providing customized side stream thermal fluid filtration systems, heat recovery systems, filtering and pumping systems for process liquids to serve industries in the United States, Canada, Australia, New Zealand, Thailand, Indonesia, Mexico, Europe, Greece, Caspian Sea Region and the Russian Federation. All systems and replacement filter elements are “Made in USA”, provided ready to install and use. Soon after installation of a Liquid Process filtration system, end users realize immediate cost savings from reduced maintenance expenditures on wearing and rotating parts, increased thermal fluid life and heat transfer efficiency. A worksheet designed to calculate payback for each unique thermal fluid application is available upon request via email: [email protected], at the website: http://www.lps-filtration.com or by calling: 704-821-1115.